If your household, like most, rarely uses the front door, you may not even think about how it looks from the street. But, your front door is an important part of your home’s curb appeal. Giving it a new look can instantly freshen up your home, becoming a welcoming focal point for guests. So, wanting to boosts your home’s curb appeal is one thing; but, how do you decide what color your front door should be painted? My opinion on front doors is simple: they can be any color you like! I don’t think a front door needs to blend into the siding of your home. Nor do I think it needs to be a bland, neutral color. Your front door should be the focal point of your home, and it should stand out from the rest of the front facade. Guests to your home should have no question about where to enter your home. That said, there are guidelines for choosing a great color for your front door. One option is to choose a deeper version of the colors already on the exterior of your home. If you have beige siding, for example, you could paint your front door a deep, rich bronze color. Or, a gray home may benefit from a charcoal-colored front door. 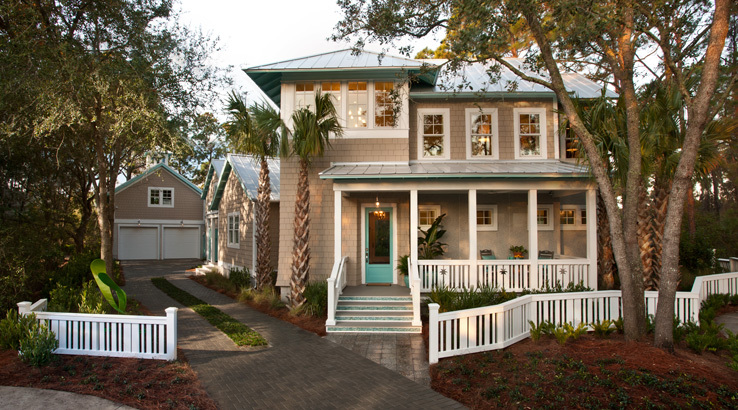 Another option is to choose a color that contrasts the exterior of your home. For example, your beige or gray home may look lovely with a brick red door, or an eggplant entry. While the options are truly endless, use both your landscape and your interior colors to help narrow your options. If the flower gardens in your front yard consist of blue and purple blooms, perhaps you would like to use navy or royal blue on your front door. Or, a golden yellow would contrast the flowers beautifully, while drawing attention to your entry. Or, if the main level of your home contains various shades of green throughout, bringing a deep olive green to the front door may be perfectly appropriate – sort of a hint to what visitors will see inside your home. Also, remember that the interior of your front door can be painted to match the interior of your home; the front door can be one color on the exterior and another inside. Your front door can have personality and a look all its own. While you want it to coordinate with other elements of your home and landscape, it should be the focal point of your home. Don’t be afraid to be bold!